DESCRIPTIONIn today's world, user interfaces have to be highly dynamic,asynchronous, and reliable. To meet these demands, the programmingworld is undergoing a radical shift towards something calledFunctional Reactive Programming (FRP), or just ReactiveProgramming. FRP offers programmers a new way to construct theirapplications so that they respond directly to change. And developersspend less time tracing obscure problems and more time focusing onwhat their code should be doing. Grokking Reactive User Interfaces teaches programmers a new way ofthinking about programs and data as well as how to build robust andextensible user interfaces. 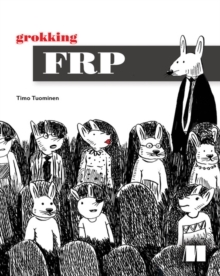 This well-illustrated book presents lots ofconcrete, real-world problems and then shows how FRP helps to solvethem. It begins by looking at examples that get readers into the mindsetof data flows and goes on to introduce the concept of a View Model. Readers also learn how FRP enables them to better manage change andintroduce new features. The final part of this book focuses on higherlevelapplication design concerns and strategies as you look atarchitectural approaches and frameworks that work well with FRPthinking. KEY FEATURES* Provides lots of illustrations and real-life app examples* Teaches a new way of thinking about programs and data* Using FRP in day-to-day programming* Teaches how to handle increasing complexity in UIsAUDIENCEReaders should have a basic understanding of mobile UI development andbe familiar with traditional object-oriented programming paradigms. ABOUT THE TECHNOLOGYFRP offers a new way to construct applications so that they respond directlyto change. FRP is not a typical technology B that obviously andimmediately replaces an inferior technology A. It's more of a way ofthinking rather than a mechanical solution.